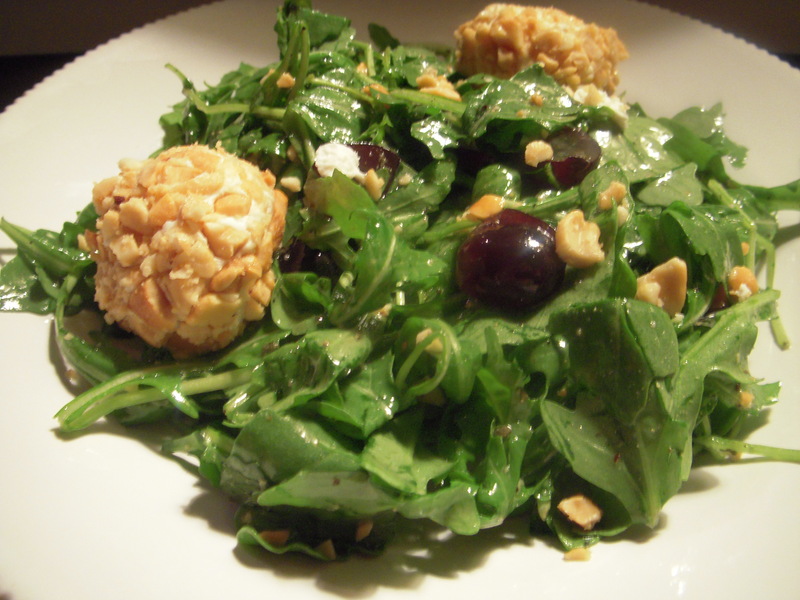 Arugula with Goat Cheese Balls | K.I.S.S. Arugula is a gourmet lettuce with a very peppery, bold taste. It is similar in strength and taste to an onion but with no aftertaste. It is a delicious and nutritious alternative to the usual salad. With its bright green color, it has a high nutritional value. The arugula pairs well with a very light vinegarette dressing. In this recipe, I used a champagne vinegarette. It worked perfectly because it allowed the flavor of the arugula to really stand out. This salad is such a light, refreshing and unique blend of flavors using only a few ingredients. The goat cheese balls are effortless but add such pretty detail. You can serve this salad to any crowd and I am sure they will be impressed! Toss together the arugula and the champagne vinegarette dressing. Add the grapes, remaining chopped cashews, and remaining crumbles of goat cheese. Toss gently to combine. Divide salad evenly among plates. Place 2 goat cheese balls along side of each salad on plate. It’s ready to serve! I hope you enjoy it!